The old, dilapidated mobile phone you replaced with a snazzy, up-to-date version was disposed of properly at the company’s collection centre. You think it has been discarded in an environment friendly way. But often that does not happen. Worse, it can contribute to the losses the country makes on account of electronic waste, or e-waste. Mobile phones have precious metals such as gold, silver and palladium; special metals such as cobalt, indium and antimony; and metals such as copper and tin. These are present in individual phones in traces, but one tonne of mobile phones has as much as 340 grams of gold, 3.5 kilograms of silver, 140 grams of palladium and 130 kilograms of copper, states a 2009 report on e-waste by the United Nations Environment Programme (UNEP). The country produces 65,000 tonnes of e-waste from mobile phones in a year. But there are very few recycling units in India to recover these, so scrap dealers extract as much as they can and export the rest. The country thus loses 70 per cent of recoverable precious metals present in electronic junk, says Ashish Chaturvedi, senior technical adviser to Indo-German Environment Partnership. Computers, mobile phones and other electronic products use a staggering 320 tonnes of gold and more than 7,500 tonnes of silver annually world wide. Often, these are 40 to 50 times richer than their ores, states a report by Global e-Sustainability Initiative (GeGI), a collaboration of members from major information and communication technology companies across the worldand United Nations University. One tonne of scrap from discarded computers contains more gold than can be produced from 17 tonnes of gold ore. A mobile phone contains five to 10 times more gold than gold ore.
Business can be quite profitable for companies that have up-to-date technology. Picture this: A e-waste contains five to 10 times more gold than gold ore. Multiply this with 350,000 tonnes of waste the country generates annually. The number is pretty lucrative. According to a study by Toxics Link, five tonnes of e-waste, which would come from 183 old models of discarded computers, can give Rs 178,308 as profit. 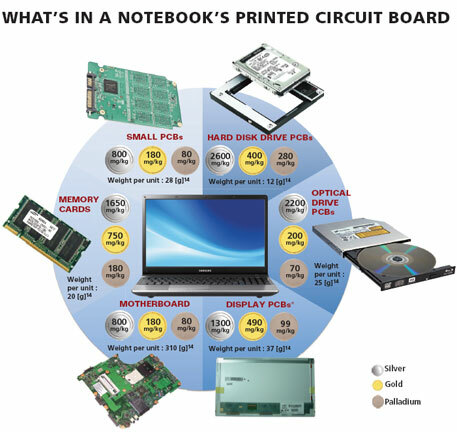 The math is simple: taking a conservative estimate, the total value of recoverable metals from 183 computers would be Rs 288,108. Logistics for collection of the waste would be about Rs 600. When multiplied with the 183 computers, the cost would come to Rs 109,800. This means the recycler can get a good Rs 178,308 as profit. What’s more, 17 precious and semi-precious metals can be extracted from e-waste, says Anand Kumar, senior environmental engineer with the Central Pollution Control Board (CPCB). But exporters get value for only four elements—gold, silver, copper and palladium. Worse, their value is much more if extracted in the country. 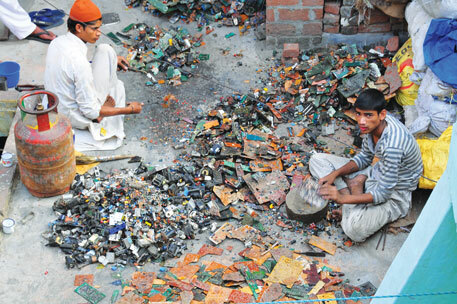 India generates 350,000 tonnes of e-waste every year. Another 50,000 tonnes are imported for dismantling. The process is cheap in India as it involves manual labour. Dismantlers, however, extract only a small amount. They export parts such as printed circuit boards, which are rich in precious metals, to countries which claim to have environmentally sound technology. Umicore Precious Metals Refining in Belgium, SIMS Recycling Solution in Singapore, Boliden at Sweden, Xstrata in Canada and DOWA in Japan possess the technical knowhow of recycling e-waste. These companies, which have been set up with huge amounts of investment, are predominantly mining companies which also extract precious metals for e-waste recyclers. India loses 50 per cent of the gold during crude dismantling, according to GeSI and Solving the E-waste Problem (StEP), an international initiative that finds solutions to e-waste management problem. According to Chaturvedi, 95 per cent of the country’s e-waste is recycled by scrap dealers, but they extract not more than 15 per cent of the precious metals. India makes huge losses considering the country’s projected growth for e-waste generation is 34 per cent every year, according to reports by non-profit Toxics Link. Mumbai, the highest e-waste producing city in the country, throws away 19,000 tonnes of e-waste in a year. Business trends show that by 2020, e-waste from mobile phones will be an astounding 18 times the current level. Computer waste will rise by 500 per cent. But E-waste (Management and Handling) Rules 2011 that became effective last year is inadequate and does not say much on export and import of e-waste. Result: precious metals easily go out of the country while developed nations dump their e-waste in the country often in the name of charity. The recycling methods that scrap dealers use are extremely harmful to environmental and human health, state studies by environmental agencies, including CPCB. They either immerse printed circuit boards and electronic parts into chemical solutions or burn them to obtain metal extracts. These two processes release toxic gases. Besides harming the environment it is an occupational hazard (see ‘IT’s underbelly’, May 31, 2010). The biggest e-waste recycling unit in the country, Roorkee-based Attero Recycling, has the capacity to treat 12,000 tonnes of e-waste in a year. The company claims it uses an environmentally sound technology, but technical experts differ. There are a few more such as Mumbai-based Eco Recycling Limited and Bengaluru-based E-Parisaraa Private Ltd which have capacities of 7,200 tonnes per annum and 1,800 tonnes per annum respectively. But they are still upgrading their technology. Recycling units in the country do not get enough e-waste because they do not pay as much for the junk as scrap dealers do. Companies are scared of making a large-scale investment in a state-of-the-art e-waste management facility in India, says owner of a dismantling unit in Kolkata on the condition of anonymity. “If I invest in setting up a proper recycling unit, there is no surety that it will get the required amount of e-waste,” he says. Many firms have set up collection centres after the E-waste (Management and Handling) Rules 2011 extended the responsibility of e-waste management to the producers. Many firms sell the collected junk to the unorganised sector at e-waste hot spots Chandni Chowk and Central Avenue in Kolkata, he says. Company officials are not ready to admit this. Spokesperson of electronics giant Lenovo claims the multinational has recycled more than 46,000 tonnes of e-waste returned by customers since May 2005. When E-waste (Management and Handling) Rules 2011 came into effect, many collectors, dismantlers and recyclers started approaching state pollution control boards to get themselves registered. According to the rules, registered collectors are supposed to handover e-waste to registered dismantlers or recyclers. They will recycle e-waste using environmentally sound technology and export the rest to countries with better e-waste treatment facilities. CPCB officials claim they are lenient on registering dismantlers and recyclers as it would help scrutinise the vast amount of e-waste that the unorganised sector collects. However, data collected from various state pollution control boards reveals that till date only about 100 registrations have been made. According to Alexis Vandendaelen of Umicore Precious Metals Refining, e-waste should be seen as opportunity rather than burden. “The phrase waste management should be replaced with resource management,” he says. The ideal way of resource management would be to first make local pre-processing efficient, followed by maximum recovery of materials and proper treatment of residual waste in countries with the best technologies for the job, with proceeds shared fairly and equitably, he says. Laxmi Raghupathy, technical specialist on e-waste and former director, environment ministry, however, says the need is to reach out to people in the informal sector because most people engaged in recycling and dismantling belong to this sector. Also, e-waste rules should be in accordance with Restriction of Hazardous Substances, the international norms issued by the EU. At present, e-waste rules and the international norms specify different amounts of metals present in electronic products. Raghupathy suggests that initially guidelines should be introduced for better management. After a period of time and experience, amendments should be made to sort out the problems. Out of 10 tonnes e-waste,minimum 5kgs of Gold & Silver, 4kgs of palladium & copper & at-least 3 kgs of Neodymium & cobalt apart can be obtained from printed circuits.